Roger E. Simpson Jr., 21, from Charleston, S.C., a second-year contra player, said, "I think we had a lot of energy tonight, I really enjoyed the show, I liked the stadium -- this is the first time in the season that we have a chance to perform in a large stadium like this. It really felt good to perform to an audience that really took to the show, and they gave a lot of support. I really heard a lot of applause!" Simpson said he performed his best effort of the season tonight. " Personally this is probably my best performance up to this point -- after some changes, I feel like it locked in a lot better than it used to be, and personally I really feel like this is my best show up to this point." Simpson's favorite portion of the Glassmen show is the ballad. " 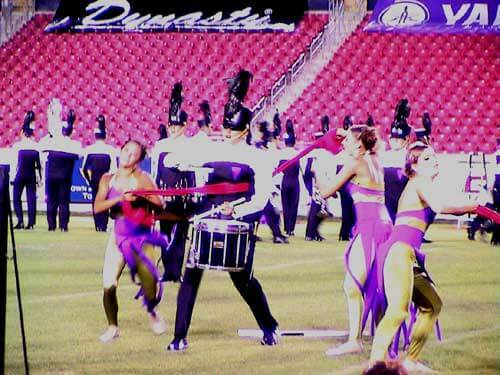 My favorite part of the show is the ballad, it's a beautiful piece, it features a lot of the brass, and it really shows off what the brass line can do."